Are 'ghost guns' a step too far? "There are 3D printers in public colleges and public spaces and there is the likelihood of potential irreparable harm," he said. Although Defense Distributed had been expected to publish the blueprints on Wednesday, it uploaded files for nine types of gun to its website last week. Between Friday and Sunday, more than 1,000 people downloaded the files for building a gun apparently modelled on the AR-15 rifle - the gun used in many of America's mass shootings. Why is the release being blocked? The lawsuit against the Trump administration was filed in Seattle by the Washington state Attorney General Bob Ferguson. New York, New Jersey, Massachusetts, Connecticut, Pennsylvania, Oregon, Maryland and District of Columbia are involved. The complaint calls the 1 August release of gun blueprints "a bell that cannot be un-rung". It raises concerns about national security implications and the safety of citizens. The 3-D printed guns are untraceable and no background checks are required. So there are fears that known criminals could easily access them. Security experts also fear that the DIY guns could evade metal detectors used in public buildings and airports. Speaking outside the court, Washington attorney general Bob Ferguson called the judge's decision a "complete, total victory". "Everything we asked for we got from Judge Lasnik," he said, and called on President Trump to make it "unlawful for anyone to make this information available for anyone". The president had tweeted on Tuesday before the ruling that selling 3D guns to the public "doesn't seem to make much sense" after settling with Defense Distributed in June. 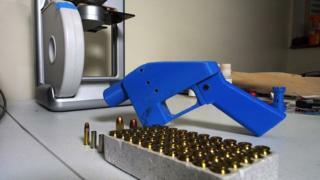 But the group's founder Cody Wilson told the BBC the 3D gun was not a threat to public safety. "I haven't watched any crimes be committed with it," he said. "As far as I know only one person's ever been arrested because of this gun and it was a gentleman in Japan who was curious about making it." How was the printable gun developed? The arguments began in 2013 when Mr Wilson, a self-styled crypto-anarchist, showed off the world's first 3D-printed gun. Files showing how to replicate the process were immediately made available on the Defense Distributed website and downloaded hundreds of thousands of times. It led the US State Department to order them to be removed from the internet. There followed a four-year legal battle, with Defense Distributed joining forces with the Second Amendment Foundation - which defends the right to own guns - to sue the State Department. Last month, in a surprise move, it won its case, with the US Justice Department ruling that Americans may "access, discuss, use and reproduce" the technical data. Mr Wilson hailed his victory as the beginning of "the age of the downloadable gun". But critics are concerned it will see a massive rise in so-called ghost guns, unregistered weapons the government is unaware of and is unable to trace. Since the legal action began, Defense Distributed has been working on new gun designs and has also created a milling device - known as Ghost Gunner - that can turn parts purchased online into a fully working weapon.